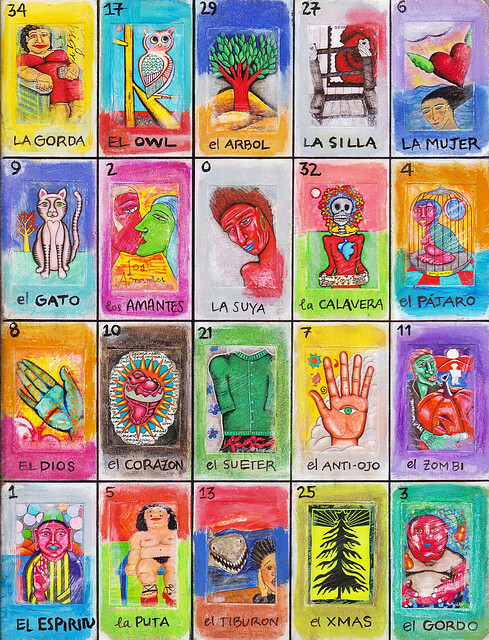 Lotería Journal, altered Moleskine cover with ybonesy doodles (plus Caran d’Arch, gouache, and ink pen), design © 2010 by ybonesy, all rights reserved. I love journals. I’ve written about my love of journals. I have doodle journals and writing journals, and I even have my first ever journal, a gift from my sister Bobbi, who got it for me as part of a Scholastic book order she made for her new class. She gave it to me about the time she started teaching: 1974. I was 13 years old, a newly minted teen, and my journal (it was actually more of a diary, although I’m not sure what the difference is) was the perfect place to log news of piddly babysitting jobs (for which it was not uncommon to make 75 cents! ), swim lessons, and crushes. That early journal got me believing that any life—even one so boring as my own—was worth recording. That’s the beauty of the journal. That it might collect the ordinary and occasional extraordinary goings-on of your existence. And that someday you might look back on it as one experiences the family photo album. Memory, insight, a looking glass into your world, or at least a snippet of it. 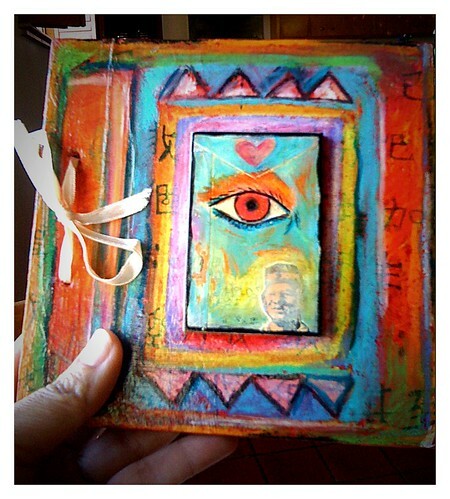 So it is not surprising that I’ve recently discovered the joy of making journal art. I’m not sure what else to call it. 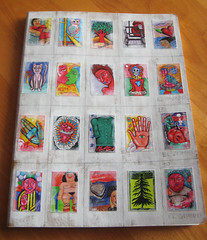 I take blank journals—the basic Moleskine works great—then figure out designs to create on the covers. It’s a fun project, one that can easily be done over a long holiday weekend. Moleskine or other journal – I like the Moleskine brand, but it is a bit pricey. Any simple journal will do; for this project it’s best to stay away from leather or cloth covers. 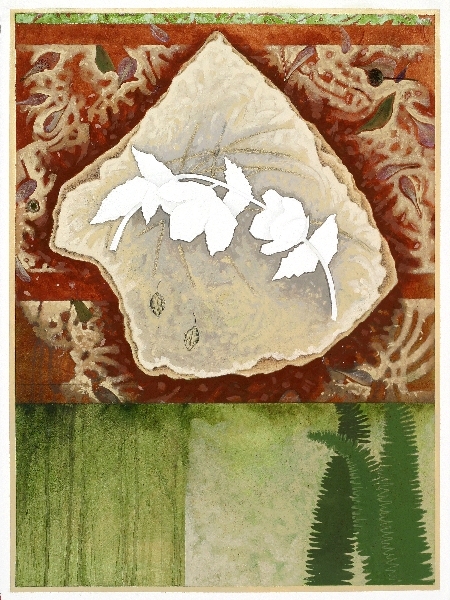 Gesso – to apply to the cover so that you can color or paint the cover (the gesso acts both as a whitening agent to better absorb and reflect light in color, as well as a primer so that whatever you apply bonds well to the surface). 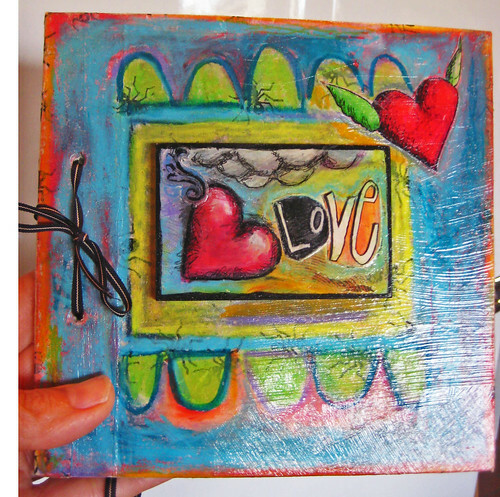 Evenly sized images – for this journal I used my own, but you could cut images out of magazines or tear out cool papers and draw different designs on each one. 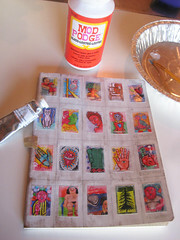 Mod Podge – to glue the images to the Moleskine cover, and later, once the piece is completely done, I’ll paint the entire cover with Mod Podge to seal the design and give it a glossy finish. 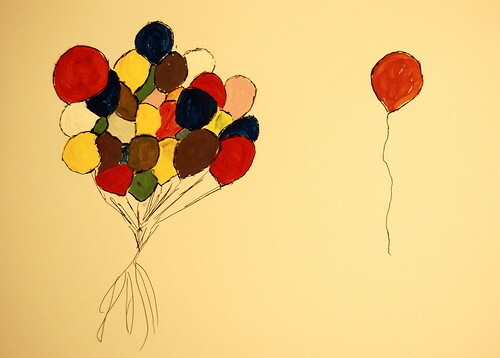 Paints and wax crayons – to add color. A black pen, preferably permanent, but if you use an impermanent one, just make sure it is completely dry, and when you do your final paint with Mod Podge, do a quick brush; don’t go back and forth or linger else the black ink will smudge. Brushes – a one-inch one for the Mod Podge and a small one for my paints (both of which I keep in water while I’m not using them). And given that we are in the Thanksgiving season, I can’t think of a better use of a lovingly created journal than to transform it into a Gratitude Journal. Now, folks out there may practice daily Gratitude, but for my part, this is an area that I’d like to improve. I want to spend more time giving thanks for what I have and less time wanting whatever it is I don’t have. A Gratitude Journal can take several forms. One idea is to use it as a way to say Thank-You to someone in your life. 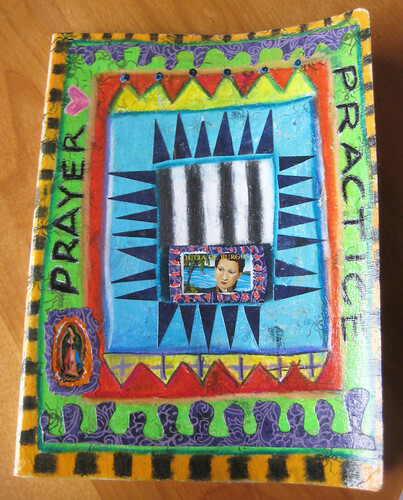 My sister Janet once created this type of Gratitude Journal for me, although we didn’t call it that back then. But now as I think about it, that’s exactly what it was. About thirteen years ago I organized a trip to Spain for my dad, Janet, another sister, and my sister-in-law. The five of us spent two weeks traveling all over the country, staying in unique and at times quirky places. An olive-farm-turned-bed-and-breakfast, a renovated monastery, and a former brothel, for example. We had a wonderful time, and afterward Janet made me a journal as a memento of our experience. Handmade paper adorned the front and back covers, and inside on a long single sheet of paper that she folded like an accordion, she made a collage of different scenes from the trip. You could create a Gratitude Journal and inside turn it into a personalized Thank You to someone close to you. I know I often pull out the journal my sister made for me. It’s so much richer than a Thank You card. A Gratitude Journal could also be something you keep for yourself over a certain period of time—say, the upcoming year—to help practice gratitude in your life. There are a lot of ways you can do this. For example, each day you could think about what it is you’re grateful for and then write about that particular topic. Or make a doodle about it, or do a collage on that page. QuoinMonkey wrote a post at the end of 2007 titled Feelin’ Down For The Holidays? Make A Gratitude List. She made her list at the end of the year, as has been a tradition of hers for several years now. Here you can see her Gratitude List from 2007 looking forward to 2008, along with mine. And here are QM’s Gratitude Lists from 2009 and 2010. You could follow QM’s example and dedicate a sheet of paper to each letter of the alphabet and see what flows onto the page. Or maybe your Gratitude Journal project is more about simply focusing this weekend on creating a beautiful cover for your journal. 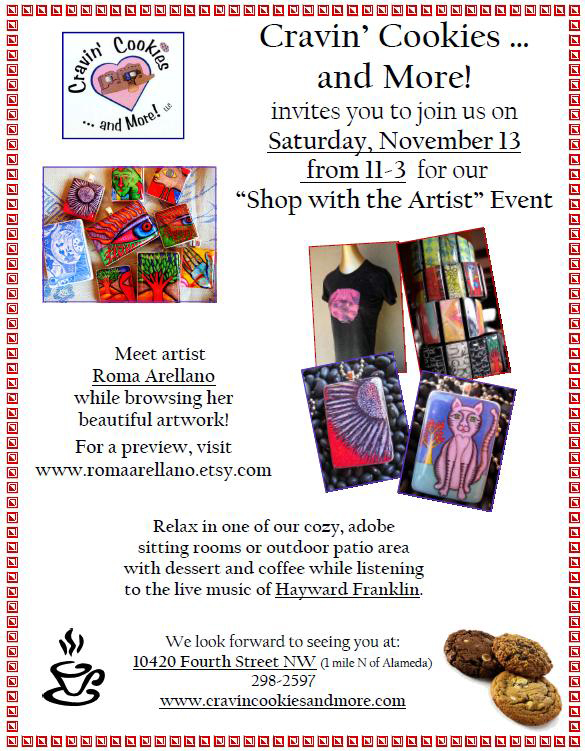 Maybe that in itself is the act of Gratitude, giving Thanks by allowing yourself to spend a few hours making art. And speaking of giving Thanks, QM and I are immensely grateful for the community and inspiration we’ve received over the years from working together and from all of you. Journal Art, mixed media journal covers—washi paper, Caran d’Arch, collage, small wooden canvases top two), postage stamp (third), stickers, etc., design © 2010 by ybonesy, all rights reserved. 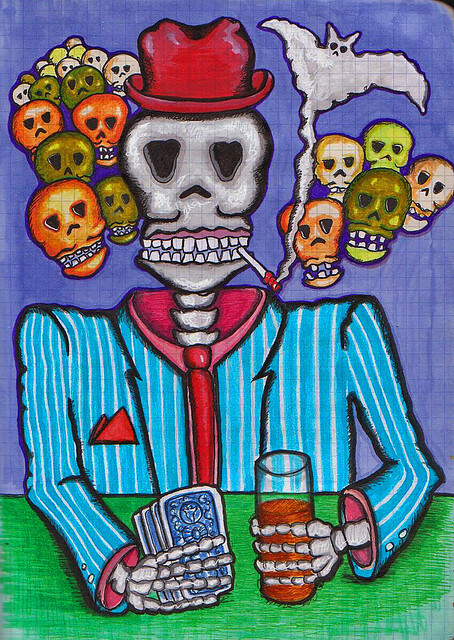 Mr. Calavera (calavera is the Spanish word for skeleton), pen and marker on graph paper, doodle © 2010 by ybonesy. All rights reserved. The Missus will be happy. I finally finished the drawing of her husband. He’s not an easy man—a hard-drinking, hard-living type who would have driven any good woman to die of love. But he’s also an old-fashioned guy, opens doors for women (probably too many doors and Lord knows where they lead) and his kids crawl all over him when he comes home late smelling of whiskey. He can ride a horse and slaughter a cow, grow a garden, hold his liquor. A man’s man. And a decent poker player, to boot. And you know what? He’s just as devilish in the afterworld as he was in this one. But that’s OK, because over there life is easy. For the both of them. No guilt or sin or any of the baggage that keeps us running in circles in this world. 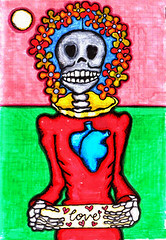 Day of the Dead was celebrated last week on November 2nd. I hope my lovely couple—fashioned after my grandmother and grandfather, although if he really were Grandpa, he’d be wearing jeans and a cowboy hat, and a bolo tie if he had to dress up; everything else is the same, though—had a great time. In this world they had a combustible marriage. Too many poker games, plus that damned redhead on Coco Street, and gambling away dinner for the next two weeks, which brought about a swing of the broom, or worse, when he came home late at night with his paycheck gone. But they were bigger-than-life-sized characters. I wouldn’t have wanted them to be any less explosive or colorful or real. I’m thinking of them this early November. Realizing how with each passing year I inch a little closer to taking their place in my family chain. Happy Day of the Dead, all you living (for now) folk! …so we pulled out the Dominoes and starting playing. 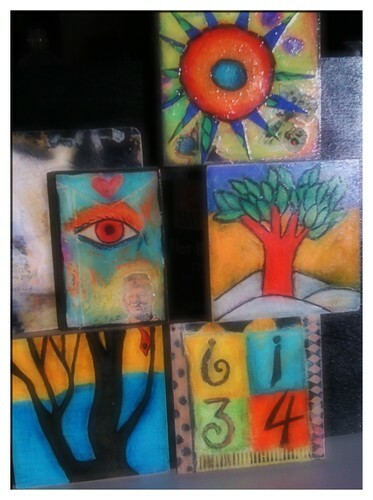 Domino collages in process, in all stages of becoming domed resin pendants, images and photo © 2009 by ybonesy. All rights reserved. Sea of Pendants, different sizes of pendants in process of being made, images and photo © by ybonesy. All rights reserved. 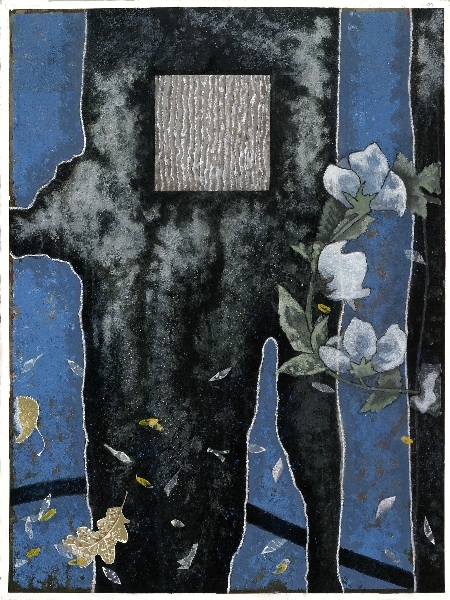 …I have a sea of Domino collages. 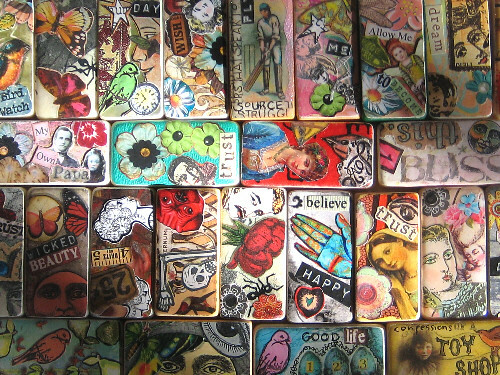 Sea of Domino Collages, some covered with domed resin and others not, images and photo © 2009 by ybonesy. All rights reserved. Dominoes. I like to use vintage that come from incomplete sets. Why incomplete? Because vintage domino sets, especially those made of Bakelite, are worth a lot, and I hate to break them up given that people pay top dollar to collect whole sets. I found an antique store owner who had a bunch of random dominoes in her sun tea jar back in her kitchen. She brought in about 60 and sold them to me for $20! 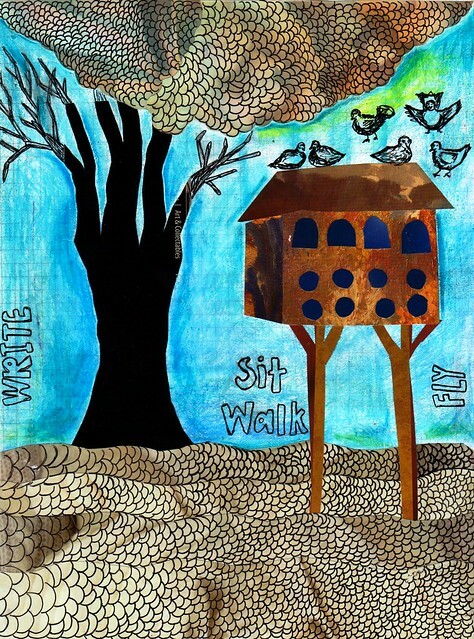 Images, including your own words from journals, pictures from magazines, stamps, doodles, photos—anything you can find. Stickers work well, but mostly I cut mine from crafts magazines. 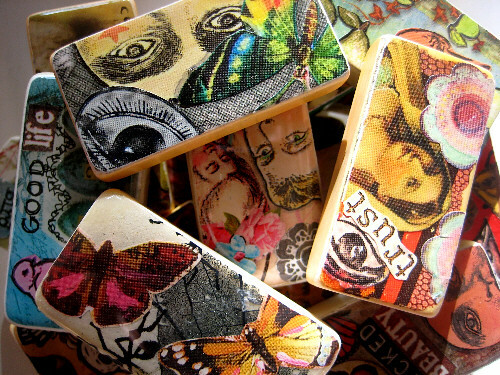 Mod Podge to glue the images down to the domino. Doming resin, which is described in the tutorial that I linked to in my Scrabble pendant post (see above link). 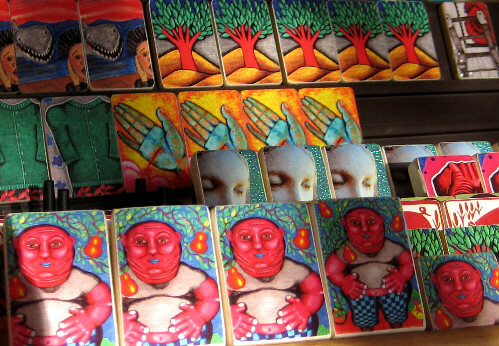 Once the resin is cured, you can turn the domino collages into pendants, magnets, or key chains. I’ll make pendants out of mine. I will try to provide a more thorough How-to once I get past this show, but I can tell you now that it’s so easy, my girls got into making them with me. And I loved how quickly they did it; their Beginner’s Mind did not over-analyze what to put where and whether the message was just so. They slapped down their images and threw on the Mod Podge. But the folk festival is afoot, and all my energy between tonight and Sunday morning will go to getting ready. 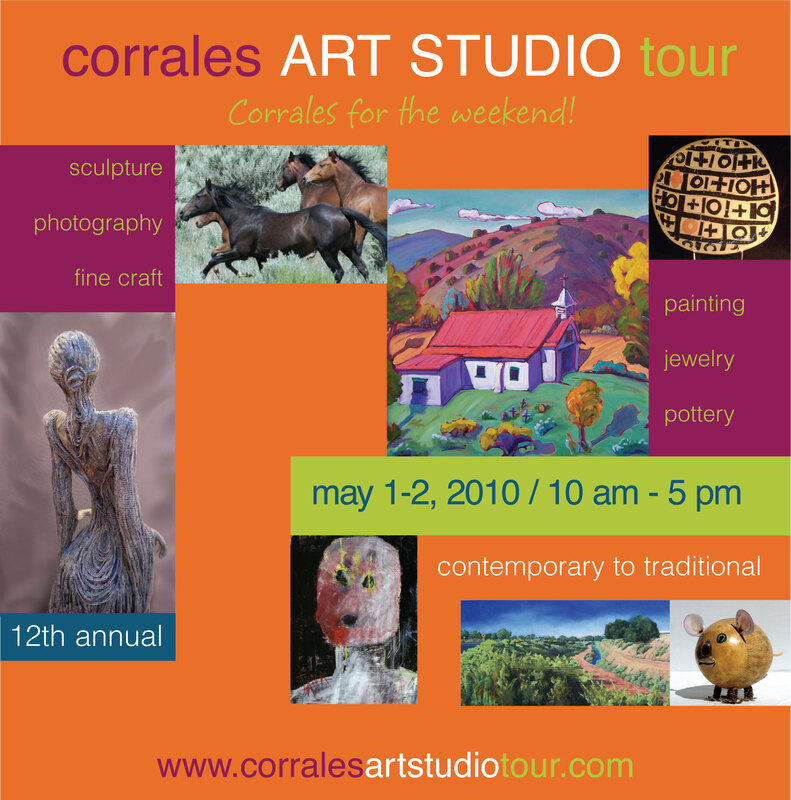 I hope all you Albuquerque folk will go to the festival, too. There will be a giant puppet parade, theater, over 100 vendors, and fun for the whole family.